I think we can all agree that visiting Hogwarts during the holidays would be just about the most magical thing in the world. Snow covering the grounds as ice crystals form on the ornate windows. Snowy owls coo while delivering cards from family and friends. Earthen mugs brim with steamy Butterbeer in the Great Hall. I wanted to capture the sense of warmth I felt when watching or reading the Christmas scenes from Harry Potter and find a way to bring them home for my holiday season through decorations as well as gifts to spread the magic to others in my life. Much to the luck of Potter fans, it seems like almost every brand is coming out with lines inspired by the boy who lived these days. I rounded up a few items to help light up your holiday season before you can even say Lumos. If you don't already know your Hogwarts house to help decide which blanket to buy, you may need one of these Sorting Hat Bath Bombs from Wick and Lather on Etsy. You can practice self care while having your own sorting ceremony. Sounds pretty ideal to me. But just to be safe, you should also take your sorting quiz on Pottermore to double check that you've been sorted into the correct house. 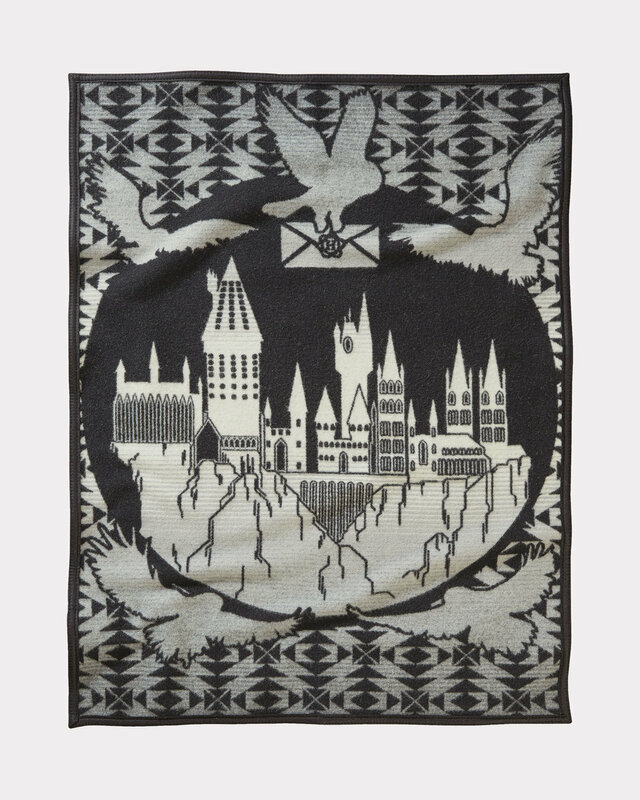 Now that you're sure of your Hogwarts house, the Williams Sonoma Harry Potter collection will be calling your name. Not only do they have these awesome spatulas - perfect to use while baking Christmas cookies - but they also have matching aprons so you can keep your dress robes clean for the Yule Ball. Lets face it, your Harry Potter books are probably looking a little aged due to heavy use, so you may need an extra set to keep pristine and on display. Or maybe you want to pick up a special set for someone who has never read them before. Are these not the most gorgeous covers you've ever seen! Would I be a bad Ravenclaw if I said I wanted the Slytherin version? Don't worry, they have all four houses available and they even come in a little trunk so you'll be ready to take them onboard the Hogwarts Express. I love Luna just about as much as I love campfire mugs. 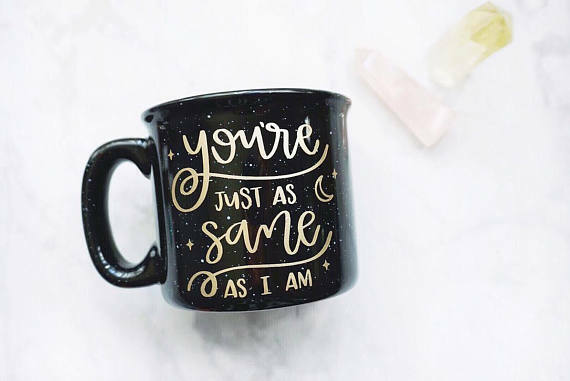 This mug from A Little Tinsel would be perfect for sipping warm brews by the fire all winter long or would make a perfect gift for a fellow Ravenclaw... hint hint. If you don't have a working fireplace in your home, the next best thing is to have some lovely candles burning all winter long. I love the candle designs from Highland Bluff Studio - the glass jars with subtle designs make them perfect for displaying or to give as gifts. 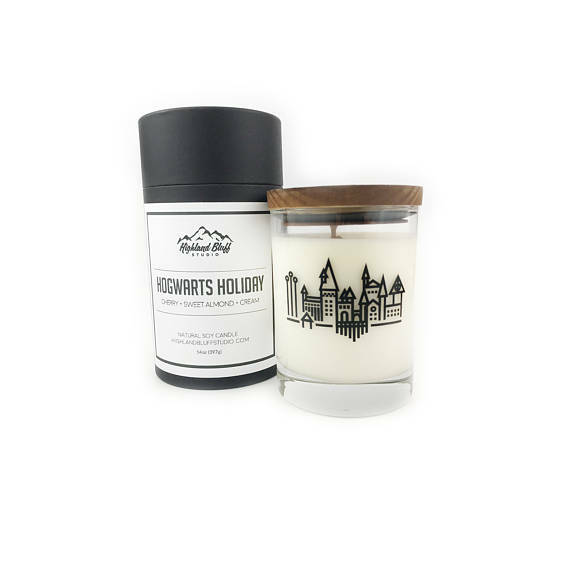 They have tons of Harry Potter inspired scents to choose from in their shop. I know you'll probably be making lots of lists, checking them at least once or twice, writing holiday cards. You might need a good set of pencils. These spell pencils from Pencil Me In Shop on Etsy are perfect for gifting or every day use. They also come in a variety of colors so you can show your house pride. They may also double as wands for banishing dark lords and boggarts. Would it be cheesy to describe this pillow from PBTeen as dreamy? 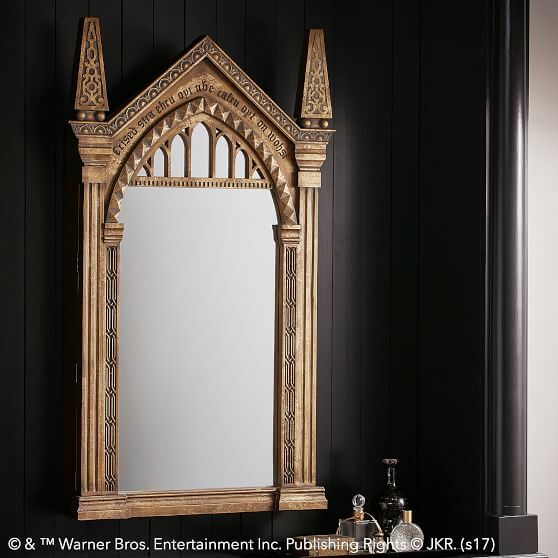 Their entire Harry Potter collection is so magical it can turn any room into a Room of Requirement - if your need is for a room that's cozy and full of fun decor. 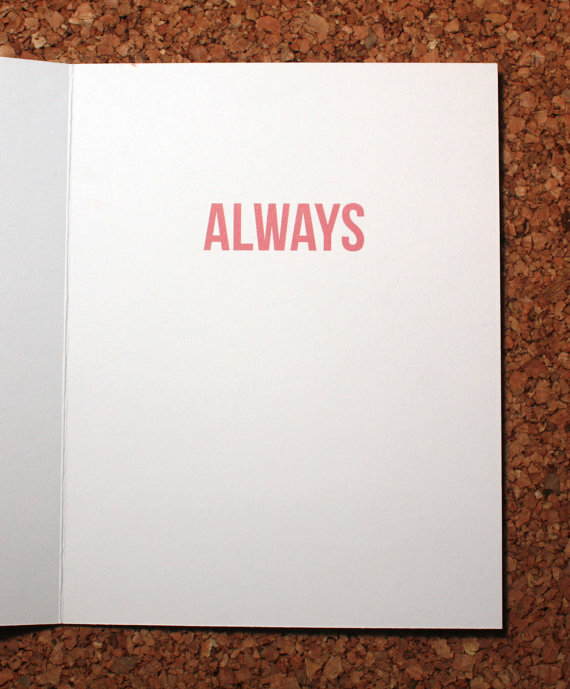 Wham Cards on Etsy definitely has adorable Harry Potter card-making down to a science. 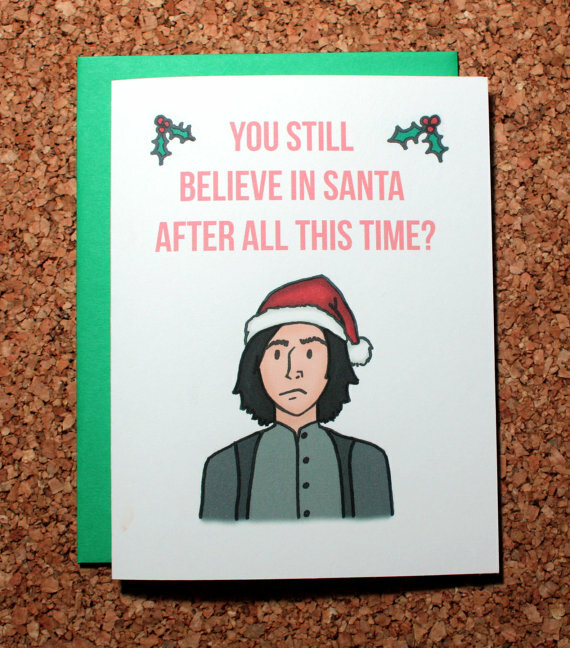 Who wouldn't want this little Severus card in the mail around the holidays? Okay... this one is pretty steep at $399 but honestly I think if I looked into it I'd just see myself holding the mirror because it's SO PERFECT. Oh, and it also opens up to hold your jewelry so it's practical and not just completely beautiful and the best Christmas gift ever. How are you making your holiday season magical this year? Let me know in the comments!